Collecting parts: The VR-4 puzzle becomes clearer – Garage Dusty Exciting Car Team! Facelift bumper and a pair of doors… Will have to get the driver’s window tinted to match the front door I got, and the passenger rear door window tinted to match the existing rear windows. A little extra cash but meh. All to a good cause. The bumper is a little damaged – I’ll be taking it off to a bumper repair joint to get plastic welded and smoothed off ASAP, ready for paint. Facelift model tail lights. That’s the full facelift sorted now – inside and out. Well, once it is all fitted up and stuff anyway. I also picked up the Bride seat I showed you last week. I love it. I already modded the rail to make it sit lower. 🙂 I’m not going to fit it until I can update some interior pieces though – more coming soon on that!! By the way, for my VR-4 friends, I will have a lot of parts for sale soon. PFL tail lights, skirts, grille, bumper (slightly damaged), bonnet (slightly damaged) etc. 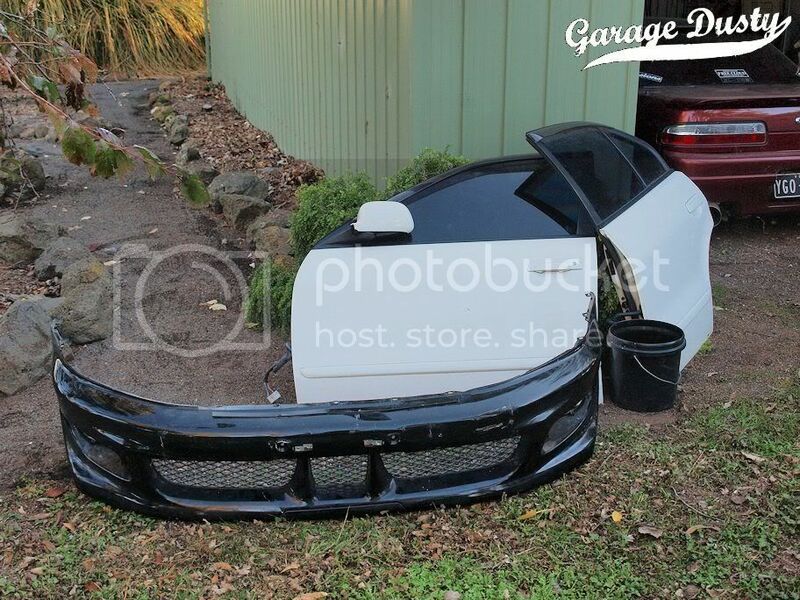 Also some un-needed FL parts – Legnum rear pods and front bumper flare extensions. A Legnum rear strut brace is up for grabs too. If there is anything you want please let me know. Prices will be super reasonable. Promise.